Historic, preserved and fully working volunteer heritage railway. Several locos and rolling stock saw active service in WW1. 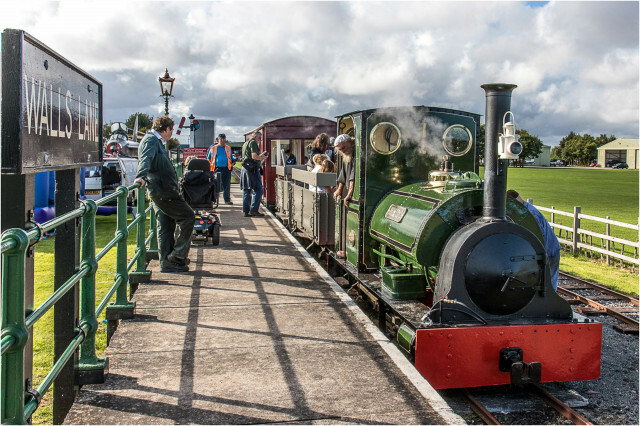 Steam days, trains hauled by newly restored 'Jurassic' steam loco, originally built in 1904 and still running today! The railway was used on Lincolnshire Potato Farms after WW1, until tractors made it redundant in the 1950's. The railway was the first volunteer railway laid from scratch in 1960 at Humberstone, near Cleethorpes, running until 1984. It was moved to Skegness in 1990 and re-opened to fare paying passengers in 2009. Return trips along the 1.5 mile track still just £1! Skegness Water Leisure Park, Walls Lane, Ingoldmells, Skegness, Lincolnshire, PE25 1JF.